From at least 1766 BCE to the twentieth century of the Common Era, China was ruled by dynasties. A dynasty is a family that passes control from one generation to the next. A dynasty does not have to last for a long time. One Chinese dynasty lasted more than 800 years while another lasted only fifteen years. The ancient Chinese believed their ancestors in heaven had chosen their leaders. They called this the Mandate of Heaven. The Chinese people often rebelled against a weak leader if they believed he had lost the Mandate of Heaven. There are indications of an earlier Hsia Dynasty, but the Shang were the first dynasty to leave written records. The Shang also developed a lunar calendar consisting of twelve months of 30 days each. 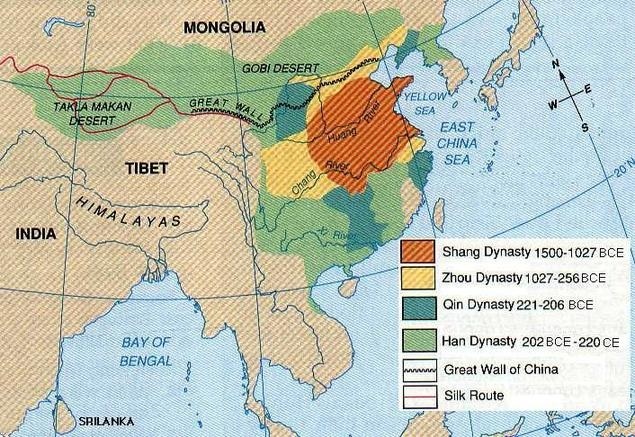 The Shang Dynasty ruled China from approximately 1766 BCE to about 1040 BCE. Shang rulers expanded the borders of their kingdom to include all of the land between Mongolia and the Pacific Ocean. The Shang practiced human sacrifice. If a Shang king died, many of his subjects would join the ruler in his grave. Some people were beheaded first but others were buried alive. When a Shang king died, his next oldest brother replaced him. When there were no brothers, the ruler’s oldest maternal nephew became king. A maternal nephew would be a child of one of the deceased king’s cousins – that is, a son of his mother’s siblings. The Chou were initially nomads who lived west of the Shang. They overthrew the Shang and ruled China from 1040BCE to the third century before the Common Era. The Chou gained power, in part, from their ability to extract iron from rocks. They used the metal to create powerful weapons. The Chou developed a feudal system in China. In a feudal system, the rulers appoint nobles to govern smaller parts of an empire. The nobles divided the land into farms for extended families. An extended family might include many generations and would often include cousins and second cousins. Landholding families were loyal to their nobles and the nobles were in turn loyal to the Chou rulers. The Chou rulers taxed their subjects, but they used the wealth they collected to build huge walls to defend their cities from nomadic warriors. The Chou also built roads, irrigation systems, and dams. Chinese nobles gradually gained more power than the Chou rulers in a period of Chinese history that historians call the Age of Warring States. It was during this period of instability that a great teacher named Confucius tried to develop good government. Rulers of the Ch'in dynasty managed to unify China and end the Age of Warring States by 221BCE. The Ch'in rulers clearly explained their laws to the people—and then strictly enforced them. Ch’in rulers standardized weights and measures and carried out irrigation projects. The Ch’in also gave peasant farmers the land they lived on. The West first learned of China during the Ch'in dynasty. It is from Ch'in that we get the word China. A group known as the Legalists influenced the Ch'in Dynasty. The Legalists believed that a powerful leader and a stable legal system were needed to create social order. The Legalists tried to suppress all thoughts that disagreed with their philosophy. People who discussed ideas not approved by the Legalists faced execution. One Ch’in ruler ordered 460 scholars to be buried alive because the scholars disagreed with the teachings of the Legalists. China grew into a powerful empire during the Han Dynasty, between 202BCE and 220CE. Scholars trained in the teachings of Confucius ran the Han governments with great skill. During the Han Dynasty, the Chinese invented paper, recorded the history of their land, and first learned of Buddhism. The last Chinese dynasty to rule came from a region of northeast China called Manchuria. The Manchus (also known as the Quing) were weak rulers who were unable to stop other nations from interfering with China. 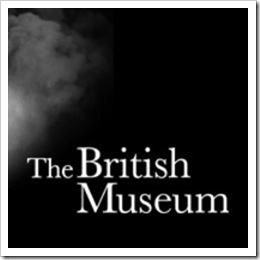 The British seized Hong Kong in 1841, but more importantly, by the middle of the nineteenth century, the British forced the Chinese government to allow them to sell a dangerous drug called opium to the Chinese people. The British defeated the Manchus in a series of conflicts that later became known as the Opium Wars. In 1894, Japan seized the island of Formosa, which later became known as Taiwan. By the dawn of the twentieth century, foreigners had overrun China. Parts of China were ruled by the British, French, American, German, Russian, and Japanese forces. The Chinese people believed that the Manchus had lost the Mandate of Heaven. They began to support a group known as the Nationalists, who pledged to free China from foreign rule. The Nationalists had driven out the last of the Manchu rulers, a six-year-old boy, by 1911.